Budding David Attenboroughs now have a means of creating home-made documentaries of their own gardens with the Brinno GardenWatchCam. 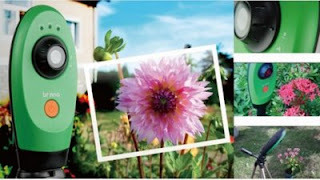 A sturdy little time-lapse digital camera, the GardenWatchCam allows you to literally watch grass grow, taking 1.3 megapixel macro images at intervals ranging from one picture a minute to one a day. Photos are stored as JPEG images on an included 2GB USB flash drive, which can then be plugged straight into your computer and downloaded for easy playback as a movie file. The camera lens adjusts from 20 inches to infinity, so you can choose to capture the growth of a single flower or observe your entire garden. And, because the device sleeps between photos, one set of four AA batteries will last up to six months. Weather resistant and discreetly green, the GardenWatchCam is designed to naturally blend in to a garden. But, of course, it needn’t just be gardens you document. You could speed the painfully slow process of building a house, for example, into a two-minute masterwork of construction. Or watch leaves change color... or figure out whose dog keeps fouling your lawn. The Brinno GardenWatchCam is available on Amazon for USD$139.95.